Odia newspaper Sambad carried this featured column of mine yesterday in their Sunday supplement "Sambada Rabibara" on December 6, 2015. It sheds light on how important it is to digitize published work and make them available in open standard. Odia Wikisource, a sister project of Odia Wikipedia and a free and open online library, is growing up with more and more Odia books every day. With a vast majority of the native language speakers seeking knowledge online, useful content like available online is going to pay a very crucial role. 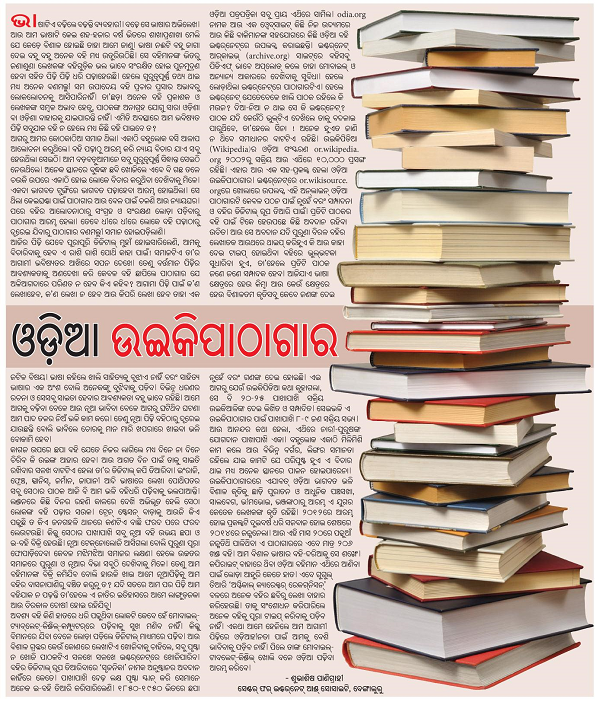 Be it popular literature or popular science writings, Odia Wikisource is growing up with books of various genre and helping preserve old published works. ଭାଷାଟିଏ ବଢ଼ିଲେ ବଢ଼ନ୍ତି ବ୍ୟବହାରୀ । ବଢ଼େ ସେ ଭାଷାର ଅଭିଲେଖ । ଆଉ ଆମ ଭାଷାଟି କେଇ ଶହ-ହଜାର ବର୍ଷ ଭିତରେ ଶାଖା ପ୍ରଶାଖା ମେଲି ଯେ କେଡ଼େ ବିଶାଳ ହୋଇଛି ତାହା ଆମେ ଜାଣୁ । ଭାଷା ନଈଟି ବହୁ ଜାଗା ଦେଇ ବହୁ ବହୁ ଅନେକ ବହି ମଧ୍ୟ ଉତୁରିଉଠିଛି । ସେ ବହିମାନଙ୍କ ଭିତରୁ ଜଣାଶୁଣା ଲେଖକଙ୍କ ବହିଗୁଡ଼ିକ ଭଲ ଭାବେ ସଂରକ୍ଷିତ ହୋଇ ପୁନମୁଦ୍ରଣ ହେବା ସହିତ ପିଢ଼ି ପିଢ଼ି ଧରି ପଢ଼ାହେଉଛି। ହେଲେ ଗୁରୁତ୍ଵପୂର୍ଣ୍ଣ ତଥ୍ୟ ଥାଇ ମଧ୍ୟ ଅନେକ ବଣମଲ୍ଲୀ ସମ ଉପାଦେୟ ବହି ପ୍ରଚାର ପ୍ରସାର ଅଭାବରୁ ଲୋକଲୋଚନକୁ ଆସିପାରିନାହିଁ। ତା’ଛଡ଼ା ଅନେକ ବହି ପ୍ରକାଶକ ଓ ଲେଖକଙ୍କ ସମ୍ବଳ ଅଭାବ ହେତୁ, ପାଠକଙ୍କ ଅନାଗ୍ରହ ଯୋଗୁ ସାରା ଓଡ଼ିଶା ବା ଓଡ଼ିଶା ବାହାରକୁ ଯାଇପାରନ୍ତି ନାହିଁ । ଏମିତି ଅବସ୍ଥାରେ ଆମ ଭବିଷ୍ୟତ ସବୁଯାକ ବହି ନ ହେଲେ ମଧ୍ୟ କିଛି ପାଇବେ ତ?